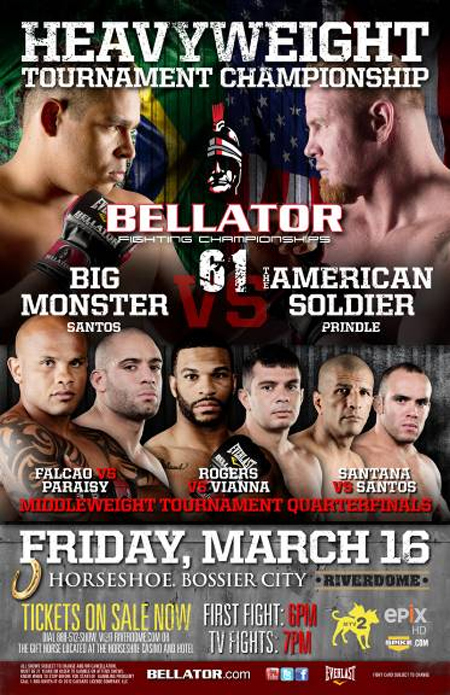 “Bellator 61” takes place this Friday inside Horseshoe Riverdome in Bossier City, Louisiana. The show features a rematch between Eric Prindle and Thiago Santos, as well as the opening round of Bellator’s Middleweight Tournament. Prindle and Santos met this past November in the Finals of Bellator’s Heavyweight tourney. Their 265-pound affair was declared a no contest after Santos delivered an accidental illegal blow to his opponent’s groin, which put Prindle out of commission. The two will determine who gets next dibs at Cole Konrad heavyweight crown. Spike.com will offer up a live stream of the night’s preliminary action live at 7PM ET/4PM PT. MTV2 broadcasts the card’s main bouts starting at 8PM ET/PT.